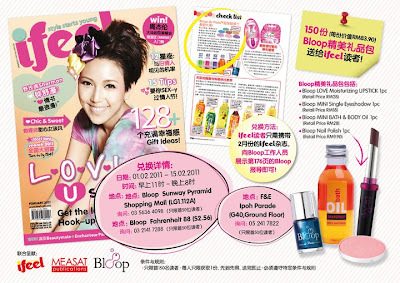 150 units of Bloop gift bag (worth RM83.90) to be giving away to ifeel's readers ! - Just bring your February Issue of ifeel to the selected venue on selected time stated below , and show them the Bloop advertisement on page 176 to redeem ! * One redemption per person only. First come first serve basis.